Bonnie Milani’s LIQUID GAMBIT is an outstanding piece of writing. Rarely does a writer give us the feel of an alien—their abilities to perceive (in this case smelling emotions), the way their bodies interact with their emotions (ears, fangs, paws/claws, their ruff), and so quickly establish a complex societal structure. The stakes are high from the opening until the end. 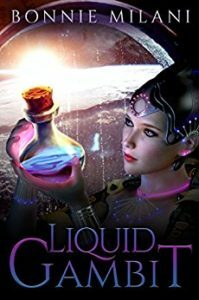 I was smiling the whole time I read THE LIQUID GAMBIT, enjoying the story and the way it was written. The only fault is that it is far too short. This should be a full novel, if not a full series. I want more!